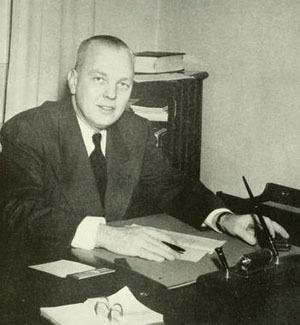 Willis Pratt, in 1949. Photo courtesy of IUP Special Collection and Archives. Did you know you can find in our online archives IUP yearbooks, alumni publications, and a wealth of other historical information? Visit www.iup.edu/archives. As I prepared my commentary for the next edition of IUP Magazine, which will be distributed in April, I was prompted to consider what makes IUP the great place that it is. The spring issue will carry an article written by Randy Jesick, who has served the university for decades, first in an administrative position and then on the Journalism and Public Relations faculty. He interviewed his mentor, Sam Furgiuele, a long-retired English Department faculty member and public relations director. It made me think about how IUP has gotten to where we are today. I am in awe of so much of the hard work that went into shaping the strong learning community we all know and support. You surely could name at least a few people who influenced your life during your association with IUP, and I have a succession of dedicated and innovative faculty and staff members to thank for this firm foundation on which I and the entire IUP community stand right now. To be sure, over the course of decades, they executed a series of transformative decisions that have positioned IUP for the very next steps we will take as we work toward our shared vision. Think about this: Most people know IUP achieved university status in 1965. Did you realize that President Willis Pratt and the faculty worked together beginning in the late 1940s to transform the curriculum to a broader set of offerings than teacher training? That decision led to the establishment of a graduate school and the eventual distinction of being the only institution in what would become Pennsylvania’s State System of Higher Education to confer the Ph.D., in addition to a selection of applied doctoral degrees. That’s a distinction we continue to enjoy today. Later, in the 1990s, with the help of alumnus and philanthropist Bob Cook ’64, IUP further distinguished itself by establishing a residential honors college. While the Cook Honors College provides an intense environment that has resulted in students bringing home to IUP numerous prestigious national prizes—such as Fulbright Awards—it also has influenced academic programming across the university, inspiring more students than ever to participate in hands-on research and study-abroad opportunities. From this perspective, the decision to establish the honors college was, indeed, a transformative moment. IUP has a responsibility to be a good steward to its host region. I view the decision to join forces with community partners, to dream big and develop, plan, and build the Kovalchick Convention and Athletic Complex as another transformative moment. While the complex is expected to pump more than $300 million into the local economy by 2021, its worth to the university and the community is priceless—while facilitating athletics contests, conferences, commencement, and other large-entertainment events, it has become a beloved destination for the region’s residents. I’d be delighted to hear what you think our other transformative moments have been—or what our next ones might be. Please leave a comment below and tell me what you think. After all, your philanthropic investment has helped to place IUP in a position to transform students from hopeful high school students to our world’s hope for the future. I have invited Leadership Society members to a special reception February 22 at Kovalchick Complex in between women’s and men’s basketball games. I look forward to saying hello, but if you can’t make it, perhaps you will be able to get to IUP for our annual Leadership Society reception on April 22. Your invitation will be in the mail soon. This is one small way we can thank you for all you do for IUP. Until then, please take a look at some of the latest news about IUP.